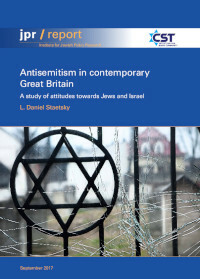 This study takes an in-depth look at attitudes towards Jews and Israel among the population of Great Britain, both across society as a whole, and in key subgroups within the population, notably the far-left, the far-right, Christians and Muslims. It introduces the concept of the ‘elastic view’ of antisemitism, arguing that as antisemitism is an attitude, it exists at different scales and levels of intensity. Thus no single figure can capture the level of antisemitism in society, and all figures need to be carefully explained and understood. It finds that only a small proportion of British adults can be categorised as ‘hard-core’ antisemites – approximately 2% – yet antisemitic ideas can be found at varying degrees of intensity across 30% of British society. Whilst this categorically does not mean that 30% of the British population is antisemitic, it does demonstrate the outer boundary of the extent to which antisemitic ideas live and breathe in British society. As such, it goes some way towards explaining why British Jews appear to be so concerned about antisemitism, as the likelihood of them encountering an antisemitic idea is much higher than that suggested by simple measures of antisemitic individuals. In this way, the research draws an important distinction between ‘counting antisemites’ and ‘measuring antisemitism’ – the counts for each are very different from one another, and have important implications for how one tackles antisemitism going forward. The research finds that levels of anti-Israelism are considerably higher than levels of anti-Jewish feeling, and that the two attitudes exist both independently of one another and separately. However, the research also demonstrates that the greater the intensity of anti-Israel attitude, the more likely it is to be accompanied by antisemitic attitudes as well. Looking at subgroups within the population, the report finds that levels of antisemitism and anti-Israelism among Christians are no different from those found across society as a whole, but among Muslims they are considerably higher on both counts. On the political spectrum, levels of antisemitism are found to be highest among the far-right, and levels of anti-Israelism are heightened across all parts of the left-wing, but particularly on the far-left. In all cases, the higher the level of anti-Israelism, the more likely it is to be accompanied by antisemitism. Yet, importantly, most of the antisemitism found in British society exists outside of these three groups – the far-left, far-right and Muslims; even at its most heightened levels of intensity, only about 15% of it can be accounted for by them.